A system should provide the tools and information to enable people to work as a team. Most commercial systems are only good at record keeping. Maintaining the data held by a system is the basic job of most business applications. Yet, although the database contains the data captured, for most systems the business process often can only be managed by generating reports. We have taken a different approach and introduced the "Workflow" to our systems. 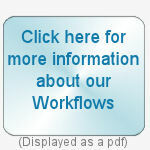 The workflows have been designed to provide overviews of all the jobs/tasks passing through each area of responsibility. Each one may be configured to help staff home in on specific chunks of information. From inside each workflow a single click reveals all the relevant information of the job or task, which can then be updated.